In the eleventh round of the ABA League, the black and whites are welcoming FMP. The game is scheduled for Saturday, December 15, at 9 PM. With two wins from Laktaši and Villeurbanne, the black and whites are coming back to Aleksandar Nikolić Hall. 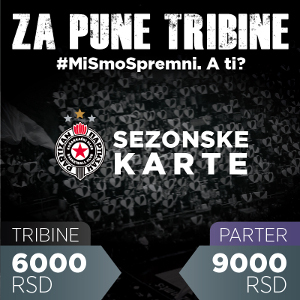 In the last match of the first part of the regional championship, Partizan NIS is welcoming FMP on Saturday, December 15, at 9 PM. Before the first out of the three games in a row that the Steamroller will play in the former Pionir Hall, the black and whites' coach, Andrea Trinchieri complimented the opponent's game, and pointed out how important it is that a team is able to win in a row. "FMP are a team that play good, smart, rational basketball. They are very tough, and we have to find a way to match them in that part. Also, it is extremely important for us to be able to win in a row", said Trinchieri. The black and whites' center, Đorđe Gagić, also expects a tough game and believes that Partizan can win. "This year as well, FMP have a good team, and they play very well. Although they have two defeats in a row, they are a team that never give up, and they will try to get back to the winning track by defeating us. So far during the season, Apić showed great shape, and we will have to pay special attention to him, but above all, it is important that we focus on ourselves, be tough during the entire game, and come to a very important victory", stressed Gagić.